Day -14: Kiira is currently in the OR getting her central line (a very tiny tube on her chest that goes into a vein, which makes it easier to do blood draws and give her medications and ultimately, the blood from the donor). She is also having an endoscopy to check for strictures in her esophagus. If she has any, they’ll do a dilation. Then they will scope her upper intestines to look for abnormalities. The inflammation in her skin could result in inflammation in her intestines, which would affect her body’s ability to absorb nutrients and could be a cause of her weight loss. But we hope her weight loss is just from her being so busy and needing to eat more. Kiira will also get a skin biopsy to check for collagen VII. She has never shown any on the past 4 biopsies, but it’s a part of the research. They will also see if any cells remain from her previous donor. Lastly, they will change out her gtube. So it’s a busy day for our girl. Please pray all goes well! Kiira did great through her time in the OR. She got her central line placed and new gtube. She had a biopsy on her leg and we should have those results in a few weeks. They also did an endoscopy. Her intestines looked normal but they did small biopsy just to make sure. 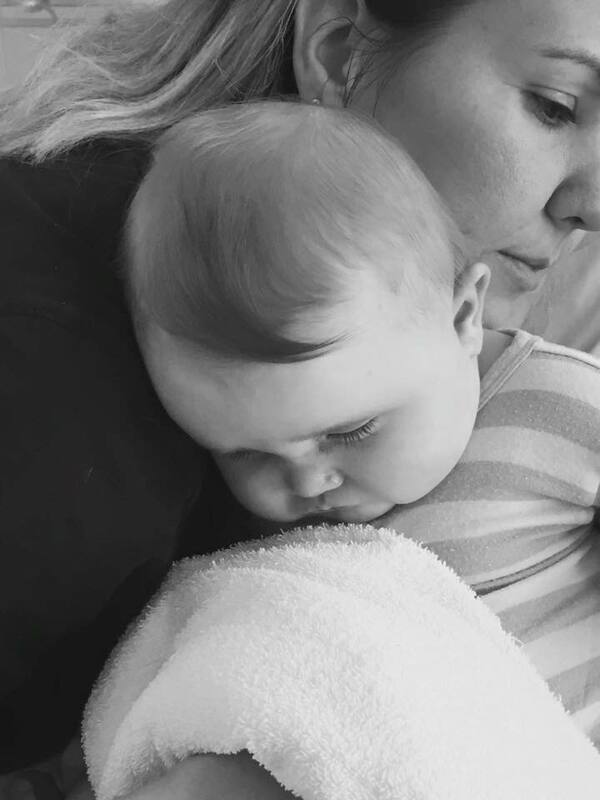 Kiira’s esophagus showed signs of blistering and slight narrowing. It wasn’t enough to do a dilation but they’ll keep an eye on it. This is very common with EB and people end up choking, even on their own saliva due to the narrowing, which occurs from blistering, webbing, and scarring in the esophagus. Therefore, frequent dilations can be required. She was pretty grumpy after coming out of anesthesia, but knowing she could see her sisters when we got home helped her. 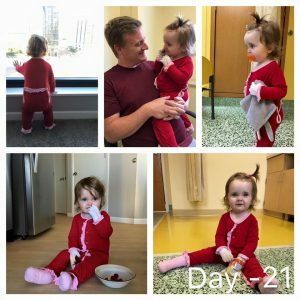 Today taught me that she will be a handful in the hospital this time around–she is definitely not the easy going baby who just lays there like last year. 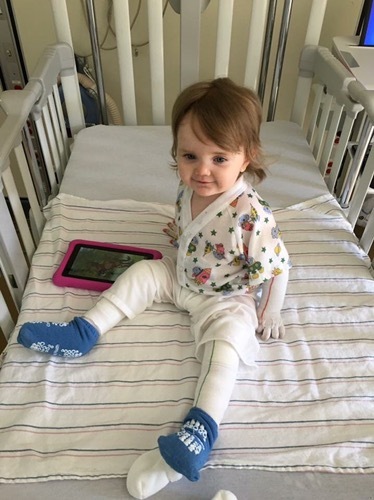 A couple days ago Kiira got to see Love for Baby Catt, who kindly provided us with new gloves and super cute slippers that Kiira loves and they actually stay on! The girls checked each other out and showed off their purses. It was so cute! 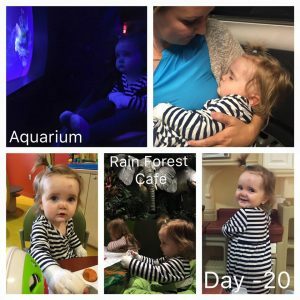 Kiira met with Dr. Tolar on Monday and we went over the basics of the BMT, but having done it before, we sort of know what to expect, although each one will be different. 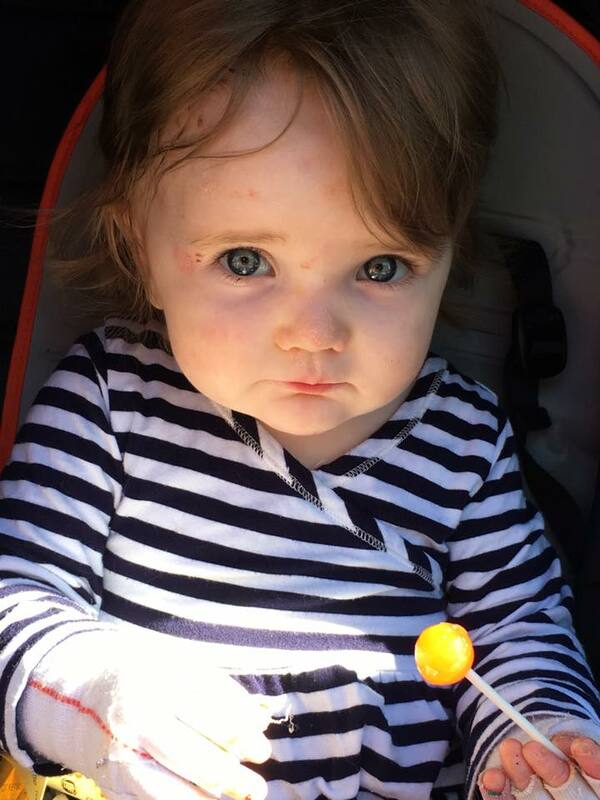 We also met with the dermatologist who determined Kiira’s rash is Nummular Eczema. This is good in that we don’t have a fungal issue to treat so Kiira’s transplant will continue as planned, but can be an ongoing issue to deal with. Yesterday we had a day off so we took the older girls on rides and Kiira shopped. She LOVES getting out and is such an angel in her stroller. Being isolated after her BMT will be tough for her. So we are thankful for today’s good outcome and your prayers. We keep taking one day at a time and it helps immensely. Also a big thank you to the sweet kids who sent Kiira some cards. Kiira loves to look at them. Tomorrow is another early, busy day, so wishing you all a good night. 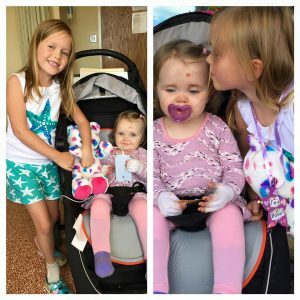 Day -16: Meet Kiira’s bone marrow donor–her big sis, Miia! We love each of our girls and this process isn’t easy on any of them. However, Miia gets to play such a huge role this time, providing an amazing gift for Kiira, filling all of us with hope, and we couldn’t be more proud of her! Day -20 (hopefully! ): Today’s appointments went so fast that we had an opportunity to meet up with the rest of family to visit the aquarium and have lunch. 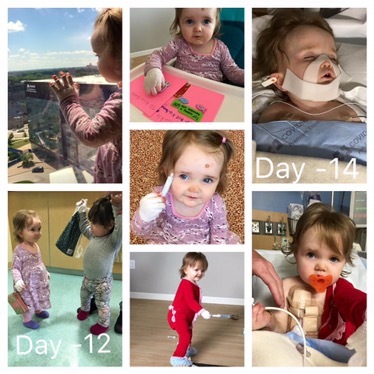 We want to give Kiira as many outside experiences while we can, because in 10 days, she will be in the hospital for about a month and then in isolation for 6-12 months. Kiira had such a busy day that she fell asleep and I got the rare chance to cuddle with her. We had a brief scare today from the team that Kiira’s rash might be ring worm or a different fungal issue. If it is, she would need to be on medication for 3-4 weeks, which means the transplant would be delayed. However, it’s clearing up with hydrocortisone, which typically wouldn’t happen with a fungal infection. The dermatologist will try to sample some skin on Monday to rule out anything fungal. This would alter our plans dramatically, so though a call from her doctor today sounded more positive about the outcome, please pray it’s not fungal. On a positive note, where its clearing up, her skin looks better than ever. So maybe the rash was here to “protect” her skin from blisters. The meeting with the dietician resulted in us increasing her calories but not changing any food content until after transplant. We don’t want to introduce any new factors since we start chemo in 10 days. Thank you for caring about Kiira and keeping us in your thoughts and prayers! Day -21: Today was a long day of appointments, including another echocardiogram and EKG. Kiira weighs in at 21.1 lbs, which is more than we thought, but still indicates weight loss since Nov. We meet with a dietician tomorrow and I’m gathering info about an anti-inflammatory gtube diet to give Kiira healthy calories to help her heal and grow normally. We found out her BMT is delayed one day, which means Kiira and Love for Baby Catt (born 2 day apart), will have BMTs on the same day! Everything looks good so far and having gone through it before, we feel more at ease, although we know it can be a totally different experience. The chemo quantities are nearly the same, but they spread them out further, so we’ll be admitted 9 days before the BMT, on July 24th. We have also been able to alleviate Kiira’s rash and dramatically reduce her itching. We hope now she can sleep more peacefully and not be in so much discomfort. We meet with a dermatologist next week and maybe they can figure out the cause (was it just heat, EB or something else?). Tomorrow we go back for more appointments. Thank you for your prayers! Day -23: We made it “home”! This time we arrived to a fully furnished apartment, which made moving in SO much easier than last year. I am beyond thankful for our insurance helping us with this process. They may not provide bandages, but they go above and beyond with treatments for Kiira to make the process easier. We are getting settled in here and both of us work tomorrow, but hope to take some time to explore our new downtown neighborhood. The girls were troopers on this road trip but beyond happy to be out of the car. We have some tough decisions and discussions ahead, so please pray that we make the right choices for our family. Thank you! Day -24: Today we drove 8+ hours from Billings, MT to Bismarck, ND with a detour around the Theodore Roosevelt National Park, a part of the Badlands. It was incredible! We finally got to see buffalo and Kiira, in her true mimicking fashion, learned how to say that plus a ton of other words this trip. I have a great picture of the buffalo walking by Kiira on my other camera, but the pics below capture the day. 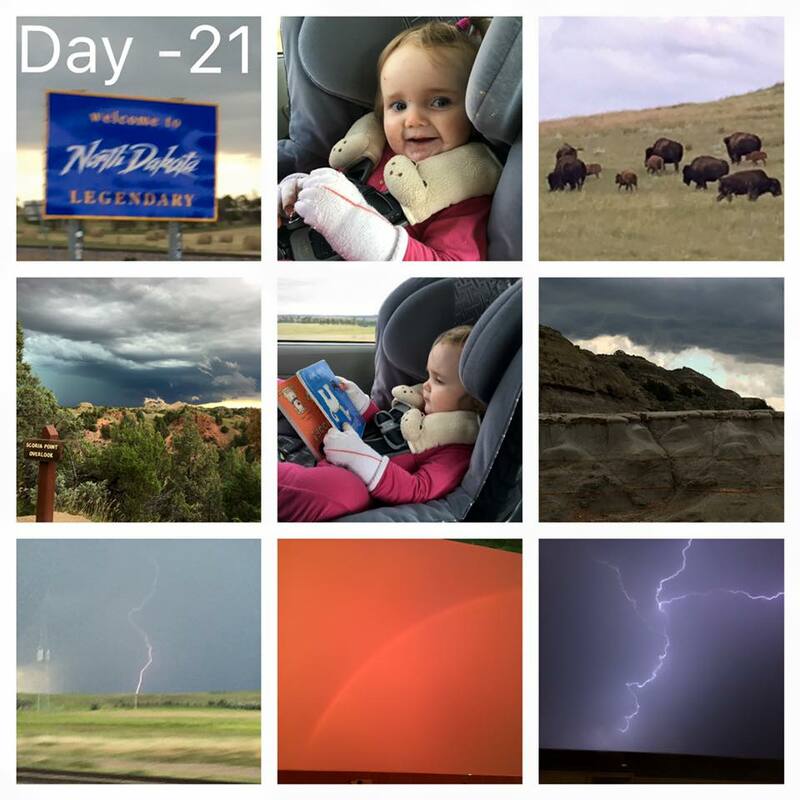 We were chased by lightening storms and they finally arrived when we got to our hotel–with downpours and constant lightening, and a rainbow in a red sky! I just pray that Kiira’s bandages, which are stored on the roof bag on our van, stayed dry! 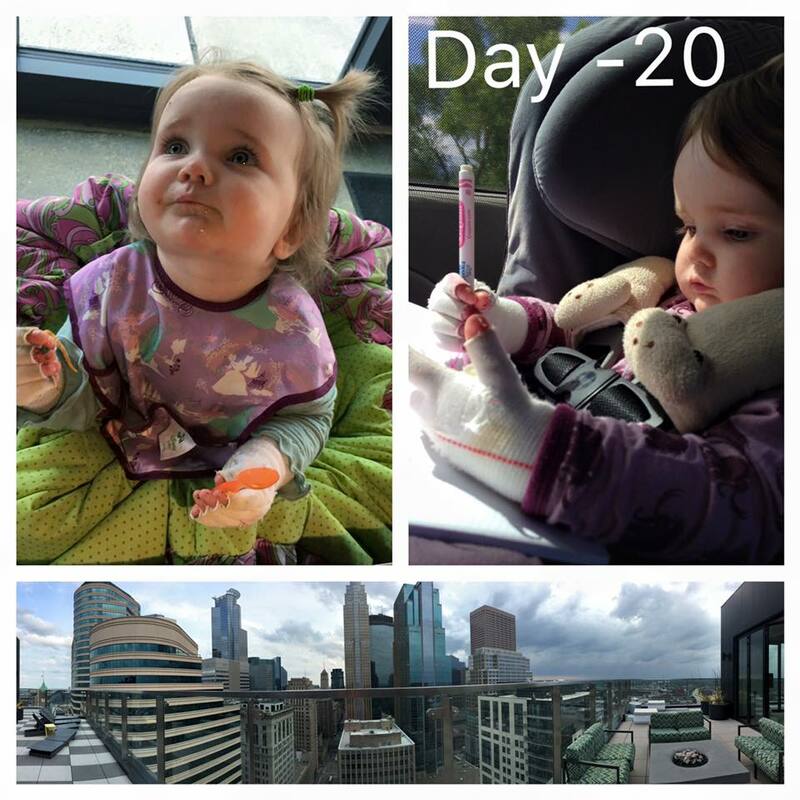 Poor Kiira sat in her seat all day and had to get bandages done when we got to the hotel. She was a champ though and let us tend to her new and old wounds. Her feet are still insanely itchy and dry and we just don’t want to resort to medicine. We look forward to meeting with all the doctors in Minneapolis next week and hopefully we can figure something out. Late tomorrow we arrive in Minneapolis and have 1 day to get settled. We got Kiira’s schedule and every day is packed with appointments from the 13th-20th, but we have the weekend off to have our last weekend of fun all together until at least November. I am filled with anticipation and concern, but so ready to get started! 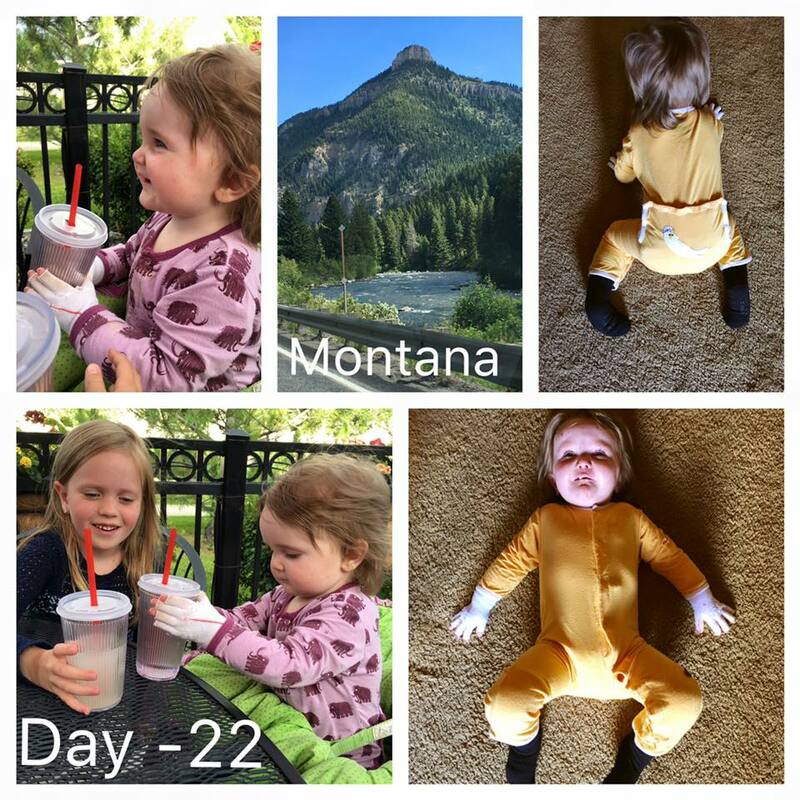 Day -25: Yesterday we stayed an extra night in Big Sky, Montana. It was nice to have a day of rest and enjoy the fresh, mountain air. Today we drove only 3 hours to Billings, Mt. We’ve gone from fits to giggles (as Kiira displays in the pictures) and lots of fun memories. It makes me sad that the girls won’t be here for Kiira starting next month, because the joy they bring her. She adores them and copies everything they do. But thank goodness for FaceTime! Only 2 more days until we arrive in Minneapolis and we begin with appointments on the 13th. We are still awaiting our final appointment schedule, but the doctors never leave us bored. Please pray that Kiira remains healthy as we enter this next phase and the rest of our drive goes smoothly! 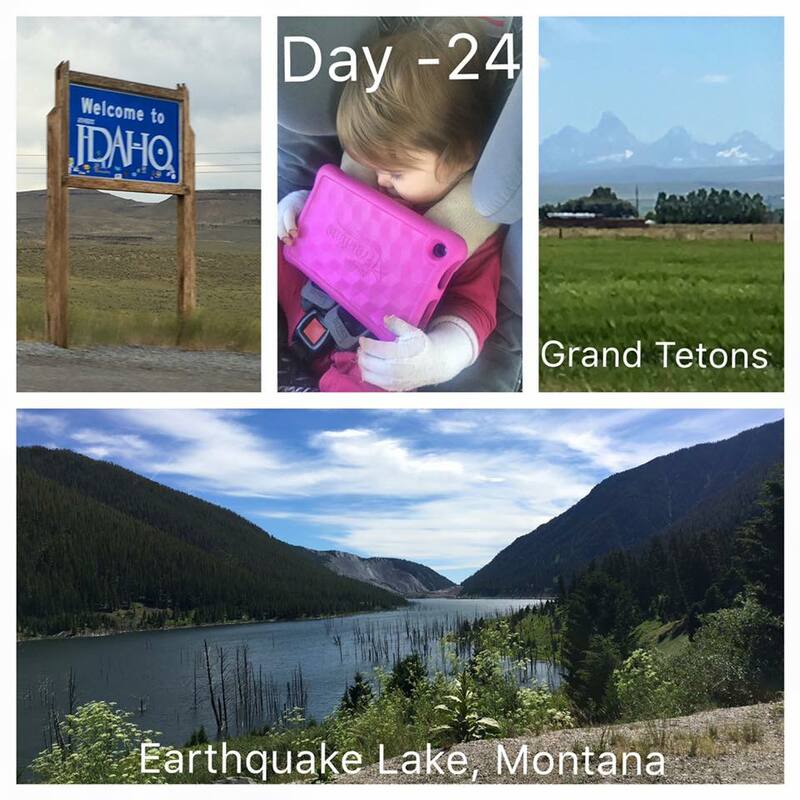 Day -27: Yesterday we drove ALL day from California to Idaho. It was uneventful and the girls did surprisingly well. Today we did a breathtaking drive to Big Sky, Montana, but made a short stop in West Yellowstone. There, a guy told us about Earthquake Lake, so we took a detour to this lake made in the 50s due to an earthquake that caused a mountain to slide down and stop a river. It was disastrous to nearby vacationers, but out of that disaster, something so unique and beautiful was created. I have to believe that despite the disasters our lives may face, God can use it to create something beautiful too. Day -28: We are off to Minnesota! Jason, all 3 girls and my mom are driving out from California over the next 6 days. We had a wonderful few days with family and friends, celebrating the 4th of July, and a prayerful send off last night. Thank you to those who came to pray over Kiira and those who said a prayer from afar. We believe all things are possible with God and that gives us hope. Day +365: So hard to believe that Kiira’s first bone marrow transplant was one year ago! We were so full of hope and anxiety and our sweet girl was so sick. This picture is from that day, day 0. We begin the count again, now at day -32. We finally have our housing set and we are so close to choosing our donor. Things are coming together and once again we feel that hope. We pray this BMT gives Kiira the relief she needs from EB.